The small island town of Nadi is situated on the west coast of Fiji`s main island Viti Levu. A tropical hideaway lined with soft golden sandy beaches and engulfed in the spectacular South Pacific Ocean. Nadi offers some dazzling destination to explore such as the breathtaking archipelago of the Mamanuca Islands encircled by vibrant coral reefs. The Sri Suva Subramaniya Swami Temple is a radiant temple and the largest Hindu temple located in the Southern Hemisphere. 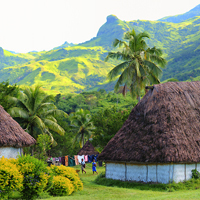 The traditional Nava Villages is nestled in the foothills of the Nausori Highlands. The sights and surroundings of this idyllic tropical island have something to offer everyone. Denarau Island, Mamanucas, Navala Village, Nadi Garden of the Sleeping Giant, Sabeto Hot Springs and Mud Bath, Nadi Produce Market, Nadi Handicraft Market and so much more! The brilliant Coral Coast stretches for miles dotted with white sand beaches and surrounded by copious lush vegetation. A coral reef runs the length of the beach creating a shallow shelf before dropping dramatically into the deep blue water of the South Pacific. Plenty of large beach resorts line the Coral Coast offering the perfect base for exploring the many pleasures of Fiji`s tropical paradise. From shopping and cultural tours to bamboo rafting and Sigatoka River Safaris, Coral Coast is the ideal spot to see and do it all. Sigatoka Sand Dunes, Sigatoka Markets, Natadola Beach, Coral Coast Railway, Kula Eco Park, Naihehe Caves, Sigatoka Valley and so much more! These unique and beautiful islands are dotted with beautiful island resorts for travellers looking that perfect beach vacation in the Fiji Islands. The islands are situated just a short boat ride or shorter plane trip from the main island of Viti Levu. The islands have a number of resorts that cater to the honeymoon and wedding market as well as resorts that offer adventure holidays for the young at heart. With islands such as Treasure Islands, Bounty Island, and many more this group has become one of Fiji`s hottest destinations. Location for the famous film `The Blue Lagoon`, The Yasawa Islands is one of Fiji`s most popular destinations for the travellers looking for the white sandy beaches and tropical island resorts. These islands are located just off the north western side of Viti Levu and are easily accessed by boat transfers and cruise ships from Denarau Marina and Loutoka. 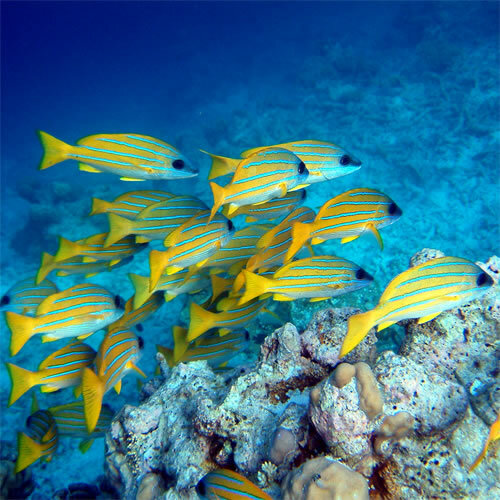 The Yasawa`s have a number of luxury resorts and backpacking accommodation with one thing in common, some of the most beautiful beaches and reefs in the world. Mana Island is a tropical paradise located in the Mamanuca Islands, approximately 32 kilometres from Nadi airport. Surrounded by white sandy beaches and crystal blue water ideal for snorkeling and swimming straight off the beach. Mana Island Resort consists of lush tropical gardens and mountainsides, with hiking to the hilltop lookout point, offering panoramic views over the Fiji islands group. Matamanoa Island is a small, intimate and secluded Fiji Island. The Island boasts a volcanic cone jutting out of the turquoise/aqua blue waters of this unspoilt area of the Fiji Islands. Clad with dense bush and palm trees, the brilliance of the vegetation contrasts magnificently with the white curved sandy beach and pristine coral reefs. The captivating Coral Coast stretches along Fiji`s southwestern shoreline for 50 miles, decorated with white sandy beaches and lined by the warm blue azure waters of the South Pacific. The Coral Coast is a family friendly area dotted with spectacular resorts including the Shangri-La`s Fijian Resort and Spa where plenty of beachfront activities take place. Catch a traditional `meke` performance which includes a `lovo` buffet dinner with authentic Polynesian and Fijian fire dances that are performed under the stars. Stroll through Sigatoka Town and visit the famous markets and buy produce from `Fiji`s salad bowl` the Sigatoka Valley, wander along the beach and climb the Sigatoka Sand Dunes for breathtaking views of the coastline. This picturesque coastline boasts some dramatic scenery with its lush mountainous interior and coral reefs lining the shores. 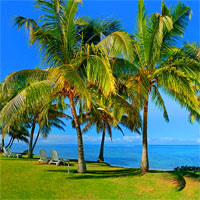 Book Your Ultimate Fiji Islands Vacation Escape, and discover its exquisite, and unspoiled tropical beauty! Visit Coral Coast, the loveliest beach on Viti Levu and see its beautiful coral reef, rugged mountainous interior, crystal clear lagoons and white sandy beaches; Then fly to Auckland, the largest city in New Zealand with its breathtaking scenery, beautiful beaches, invigorating walks, idyllic holiday islands, and outstanding food and wine. 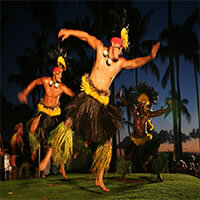 This is a flexible vacation package to South Pacific with daily departures from anywhere in the USA or Canada. Choose your length of stay. Pick your own flights, hotels and activities. Add, remove or reorder cities. Stunning Experience! Escape to Fiji, a tropical paradise with incredible sandy beaches, glorious weather, swaying coconut trees and `the friendliest people on earth`. Then discover the vibrant Oahu, with its historic Pearl Harbour, popular Diamond Head crater, beautiful beaches, fantastic hotels, excellent restaurants, and you`ve got just the perfect vacation. South Pacific Escapade!! Land in Fiji and step straight in to paradise, enjoy its spectacular beaches mingling with some of the most colourful and exotic fish. Up next flight to Auckland, the largest Polynesian city in the world, offering a wide range of shops and restaurants. Finally fly to Sydney and marvel at the stunning views of Sydney Harbour Bridge and The Opera House , letting the wind blow through your hair and realize that life is amazing. Shared Transfer from Nadi Airport to Hotel in Coral Coast. Shared Transfer from Hotel in Coral Coast to Nadi Airport. Unforgettable vacation experience! Begin this adventure flying into Melbourne, the second most popular city in Australia, where you can experience an electrifying encounter with the penguins, discover its numerous gardens and parks and enjoy the region`s slow food, fine wine and spectacular scenery. Then escape to Coral Coast, the birthplace of Fiji tourism. A brilliant stretch of small beaches and bays along the southern coast of Fiji's main island - Viti Levu. This is a truly incredible experience you won't want to miss. Unforgettable vacation experience! Visit the fascinating city of Melbourne, the second most popular city in Australia, where you can experience an electrifying encounter with the penguins, discover its numerous gardens and parks and enjoy the region`s slow food, fine wine and spectacular scenery. Then escape to Sydney, the largest, oldest, and most sophisticated city in Australia. It has been named one of the world`s most beautiful and most livable locations many times over. Lastly is Coral Coast, the birthplace of Fiji tourism. A brilliant stretch of white beach dotted by copious lush vegetation, popular back-packers, hotels and resorts still line its beautiful shore. This is a truly incredible experience you won't want to miss. Unforgettable vacation experience! Start this journey traveling to Rarotonga, and enjoy its fascinating natural beauty and physical drama. A halo of flame-orange coral reef encircles the island, and Rarotongafs sapphire-blue lagoon is trimmed by sparkling white sand beaches. Then escape to Auckland, a beautiful city that boasts a sunny, warm and temperate climate, great beaches, a beautiful harbor, fantastic shopping, and a vibrant nightlife. Lastly is Coral Coast, the birthplace of Fiji tourism. A brilliant stretch of white sand beaches dotted by copious lush vegetation, popular back-packers, hotels and resorts line its beautiful shore. Unforgettable adventure!! To have a better chance of finding the best price, try Monday arrivals . A truly memorable vacation experience! Start this journey flying to Sydney, one of the most livable places in the world. It´s main attractions include The Sydney Opera House and The Sydney Harbor Bridge. Then travel to Cairns, a modern and vibrant city, famous for being the getaway to The Great Barrier Reef. Up next is Brisbane whose famous places include The South Bank Parklands, The City Botanic Gardens and The Australia Zoo. Finally escape to Coral Coast, a stretch of brilliant white beaches and secluded bays. Hotels and resorts line its beautiful shore. Stunning Experience! Fly to the beautiful Sydney, the largest, oldest, and most sophisticated city in Australia. It has been named one of the world`s most beautiful and most livable locations many times over. Then explore Coral Coast, birthplace of Fiji tourism. A brilliant stretch of white beach dotted by copious lush vegetation, popular back-packers, hotels and resorts still line its beautiful shore. What a combination! Unbelievable adventure! Start your trip in Nadi (Fiji), offering its visitors some of the most gorgeous turquoise water beaches, shopping malls and a huge range of awesome activities. Then comes Auckland, a modern cosmopolitan city that offers just about everything, from bushes to beaches, skyscrapers to art events; this city will definitely exceed all your expectations. Fly to Queenstown, and enjoy this spectacular city surrounded by mountains, and situated on the edge of crystal clear Lake Wakatipu. The Queenstown region is famous for adventure and adrenalin activities. Then go to the marvelous Port Douglas, a superb snorkeling and breathtaking rainforest. Lastly, Fly into the marvelous city of Sydney, one of the world`s most beautiful and most livable locations many times over. Best top three destinations await! Start your vacation in Sydney, the largest, oldest, and most sophisticated city in Australia, with its sandy beaches and a spectacular harbor that features two of the most iconic structures on the planet, the Sydney Opera House and the Sydney Harbor Bridge. Then fly to Brisbane to discover its vibrant urban villages. Each suburb is a hub of activity with its own unique personality. Hallmarks include The South Bank Parklands, The City Botanic Gardens and The Australia Zoo. Lastly is Coral Coast, a brilliant stretch of white beach and secluded bays, dotted by copious lush vegetation, hotels and resorts still line its beautiful shore. Hotels and transportation were great.